The best part of university was always the tutes. You could skip the lectures if necessary, but you missed the tutorials at your own peril. I remember vividly stepping up the wide staircases of the John Medley building at 2.10pm on a Tuesday, burdened with a big folder of academic articles. You’d sit in a quiet room stuffed with too many chairs, talking about that week’s readings. These were golden hours. To speak during the tute meant you had to have done the reading. You’d hear if other people got something totally different from the assigned articles, say your piece, have people disagree with you. The shouts from South Lawn would filter through the leaves of the plane trees, but the debate at hand was always more enticing. This is where you saw what points held together, what ideas got torn apart, and worked out what topics you would write your big essay on. If the point of doing a liberal arts degree is to develop critical thinking skills, the tute was the nexus of the whole affair. The selection of smart people put in a room with an interest in understanding the topic was unparalleled. The tute was to a political science student as the weights room is to a body builder. Where you break down to get built back up. But now, I think you can build up the skills you need for university – at least somewhat – online. The best online debates remind me a lot of those tutorials. I do not mean Twitter. Twitter is more like flicking the channels on TV while yelling things nobody will hear. Not Facebook either. Facebook is synonymous with shallow debate. I’m mainly impressed by Reddit. It’s a place where you write something, and it gets marked. You can get a big fat zero (or a negative score) if you write something stupid, wrong, unhelpful, or irrelevant. You’ll get called out on your spelling and grammar, too. But if you write beautifully, logically and use references, you’ll get upvoted. The culture there (in some places at least) is quite academic. If you’re clearly spouting off your mouth without having done the reading, someone will normally slap you down. 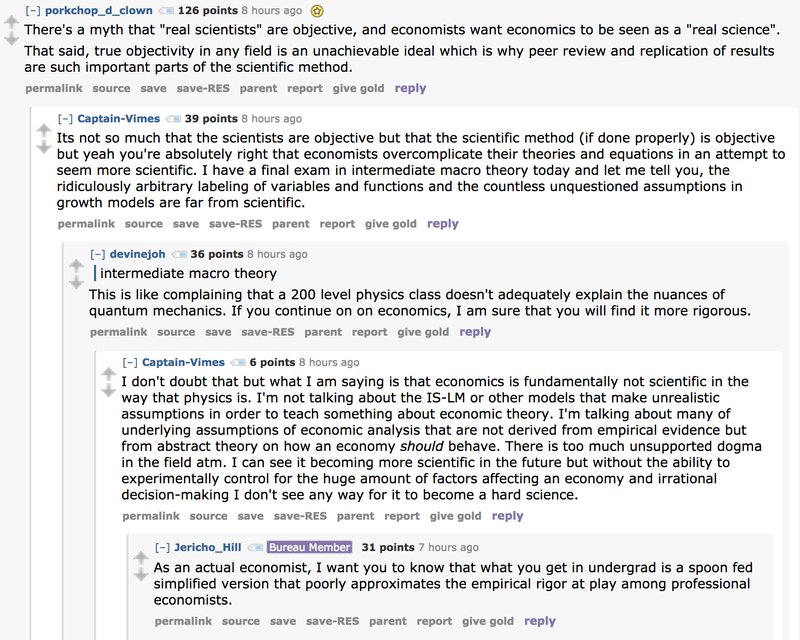 For example, here’s a debate going on in the economics subreddit today about this article at Vox, on whether and in what ways economists are partisan. What we see here are people kicking around important ideas, learning things, being respectful to each other. It may not seem like much, but it’s damn nice to see that happening on the internet. Not just in history but in physics too. Sometimes, you can see people being presented with evidence and changing their minds, in real time. At it’s best, it is quite amazing. Caveat: I do not in any way imply Reddit substitutes for university. University is comprehensive, while Reddit is merely a subset of things that are fun to talk about. And furthermore, university is not just about engaging with ideas. It’s about engaging with people. It is is also about showing up and doing the work, even when you don’t want to, while Reddit offers no points for diligent attendance. Reddit also fails where the sorting process for confirmation bias is complete, and people end up in subreddits that reflect their own points of view back at them. For example, the subreddit about the holocaust has ended up as a place for deniers. Still, using Reddit to develop your reading, writing, persuasive argument, critical analysis and grammar, plus skills in giving and receiving feedback will put you in damn good stead to make the most of a proper liberal arts education. The reason Reddit is like this seems to be its culture. It started out as a nerdy place, and it retains some sort of internal pressure to be fair and accurate. But it is growing fast. I’ve written before about what happens when the internet grows – it gets way more mundane. So there may be a time – and maybe it has already arrived – when the best place to learn and debate online is somewhere else. Online debates are probably one reason we can hope this internet *is* making us smarter. If there are other websites you love that you think also support good debate, mention them in the comments below. Previous Previous post: The man to sell tax hikes to the Australian people … is John Howard. Next Next post: Time to start getting ready for when the robots take our jobs.